People who take their dogs to obedience classes usually learn how to give a few commands, such as “sit,” “stay,” and “down.” For most dogs, these are enough. The basic commands are mostly geared toward keeping dogs under control when they’re on a leash, getting groomed, or waiting to be fed. Dogs who learn these commands are generally more sure of themselves than those who haven’t had any training at all. And, of course, they’re easier to be around. So learning the basics is good for both people and their pets. Cats can learn all of the same commands that dogs can. But since cats usually don’t accompany their owners in the car or on walks around the neighborhood, most people don’t bother teaching them. This is too bad, because it’s a lot of fun when cats wave bye-bye when you ask them to or come running on command. Regardless of the commands that you want your pets to know, the principles for teaching them are very similar. Here’s what experts advise. Always say the name first. You have to get their attention, or they won’t even hear the command. When you say their names first, they know they need to listen—it’s like telling them, “Hey, you!” The best names, incidentally, are those with two syllables, and the best commands have one. This makes it easier for pets to tell the difference. Think what happens when you say something like, “Ralph, come.” To pets, they both sound alike at first. When a name has two syllables, pets know it’s an “attention” word, and they’ll be ready to hear the command that comes next. Speak deeply to dogs. Trainers have noticed that dogs respond best to commands when they’re given in a low, slightly guttural voice. A low pitch means serious business because it’s similar to the sound of a mother’s growl. You don’t want to give high-pitched sounds. To a dog that’s like yapping—it may be annoying, but it’s not something to be taken seriously. Make mouse sounds for cats. Unlike dogs, cats don’t even notice low-pitched commands. They do notice commands that are given in a high voice, maybe with a little bit of a “sss” preceding them. The “s” sound gets their attention, and the high tone sounds similar to the pitches that rodents make—and no cat is going to ignore that. you don’t want to speak softly either. Speaking in your normal voice or a little louder will get their attention right away and let them know that you’re serious about what you’re saying. Coax them with your eyes. 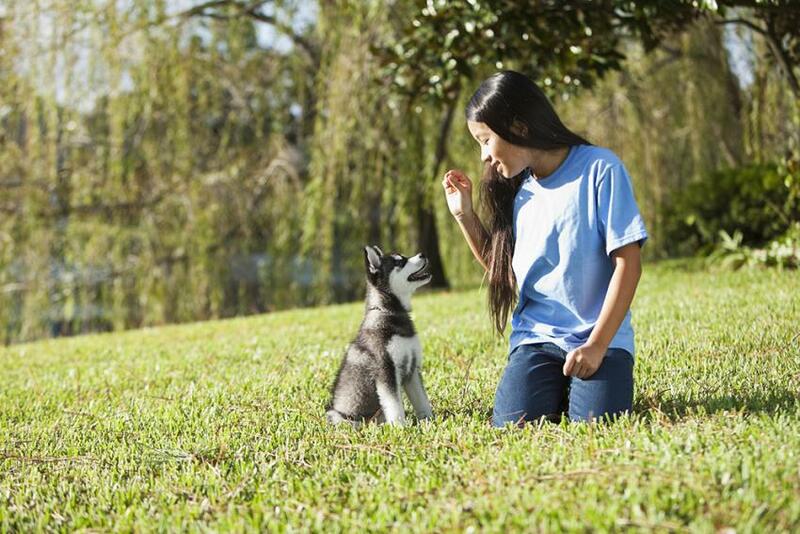 Making eye contact is important when you’re giving commands to dogs or cats. Some people think it works kind of like a “mind meld” because of the connection you form with your pets. In addition, to dogs, looking them in the eye is both a challenge and a command—it lets them know you’re higher in rank and need to be obeyed. You don’t want to stare at dogs you don’t know or those who are acting aggressively. It won’t make them want to obey; it will make them mad. But it’s fine to make eye contact with cats at any time. Give yourself big posture. Dogs are very conscious of size because in their world, bigger dogs tend to be the leaders. You can get them to view you the same way by standing up straight when giving commands. Dogs and cats read our entire way of speaking, not just the words. For dogs, you want to stand tall and act like you’re an authority figure. Shrink for cats. Bigger is better for dogs, but for cats, bending slightly at the knees and making yourself look smaller makes commands much more effective. Cats are very small compared to us. You don’t want to appear threatening, just sincere. If you stand up tall, they may get the message “I’m in trouble,” and they may take off.